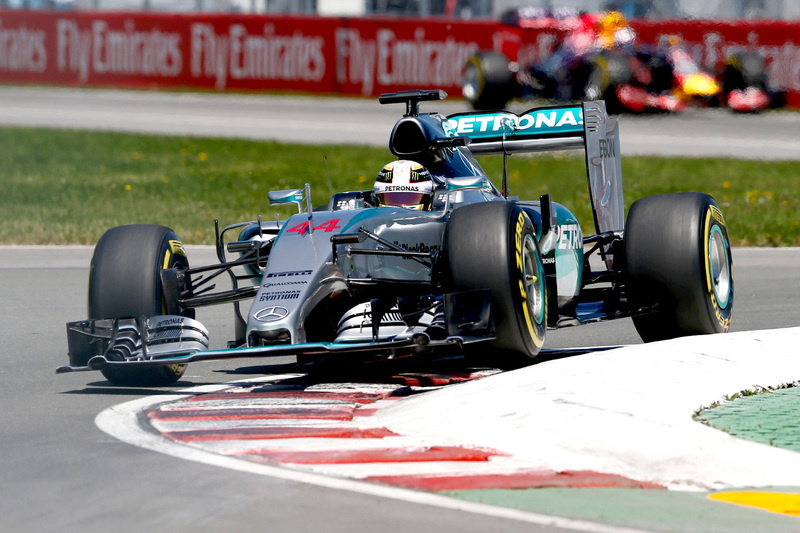 Lewis Hamilton has resumed his winning ways in 2015 with a straightforward victory at the Canadian Grand Prix. Hamilton had enough pace in hand to never be realistically challenged, despite having to save fuel for much of the second half of the race. “I love Montreal! I love this track, I love the city,” said Hamilton, who won his first grand prix here in 2007. “I really just had a fantastic weekend, it’s great to get back on the top step. “I didn’t feel I had the most comfortable balance — I had a lot of understeer, but I never felt too much under pressure. Nico was quick, but I felt under control. Hamilton also dedicated the victory to the late father of his race engineer Pete ‘Bono’ Bonnington. Teammate Nico Rosberg was able to keep the gap to the leading Mercedes to less than five second — and often closed up to within two seconds — but high brake temperatures prevented any meaningful action. “It was a good race against Lewis,” said the German. “I was pushing like mad to put the pressure on, but he didn’t make any mistakes, so fair play. Hamilton extended his lead in the drivers championship standings over Rosberg to 17 points. Valtteri Bottas, starting from fourth on the grid, was able to leapfrog Kimi Räikkönen into third after the senior Finn spun his Ferrari at the hairpin with sudden spike of power from the new Ferrari power unit on the exit of the hairpin. Räikkönen was on his first lap with new soft tyres after what should have been his only pit stop, but the spin burnt through the set and necessitated a second stop on lap 40. The gap between the leading Williams and Ferrari to the rest of the field was significant enough that the extra pit stop didn’t drop him into the pack, and he finished fourth. Bottas paid credit to his team upon collecting its — and his — first podium finish of 2015. “Really happy for us as a team,” he said. “I’m a really proud member of the team, this was really good team work all weekend. “I think we really needed this result, it really boosts the confidence. “We know that now we’re a top team and that we can fight for podiums. “The mistake Kimi made allowed us to get one position, and we also changed the plan for the strategy during the race, which was really dynamic. “It was not a bad race from me either,” he added dryly. Sebastian Vettel and Felipe Massa were contenders for driver of the day after both were eliminated in the bottom five during qualifying, after which Sebastian Vettel was demoted to nineteenth for a red flag infringement during Saturday practice. Dramatically out of place, the frontrunning duo scythed through the field on differing strategies — Vettel on a two-stop supersoft-soft-soft strategy and Massa on a one-stop soft-supersoft strategy — ending up separated by just two seconds. Massa’s standout moment was a wheel-to-wheel battle with Sauber’s Marcus Ericsson at the first turn on lap nine. Vettel, on the other hand, who made up more places in his fight towards the front, had a scrappier race, however, with a number of minor incidents running wide onto the grass and at one point squeezing Nico Hülkenberg out of the dangerous final chicane, which the stewards judged to be a racing incident. Pastor Maldonado scored his first points of the season with a measured drive to seventh place after qualifying a season-best sixth. Starting side by side with Romain Grosjean, Maldonado was outshone by teammate for much of the race, but a critical botched attempt to lap Will Stevens sent him into the pits with a puncture and tumbling to tenth. Nico Hülkenberg in eighth was the highest-placed driver to finish one lap down, 18 seconds ahead of ninth-placed Daniil Kvyat. Kvyat, finding himself in a rich vein of form since Red Bull racing advisor Helmut Marko warned him to up his game or face replacement, did well to essentially hold on to his qualifying position of P8, after taking the movements by Massa, Vettel, and Grosjean into account. His performance was in stark contrast to that of teammate Daniel Ricciardo, who fell dramatically out of touch with top ten and off the pace from early in the race, eventually finishing P13. Ricciardo, who won his first grand prix here last year, struggled with a lack of grip coupled with a Renault engine that was desperately uncompetitive on the circuit’s long straights. The Australian finished more than 11 seconds behind Sergio Perez and Carlos Sainz, who were sandwiched between Grosjean and Ricciardo as they battled for eleventh. Marcus Ericsson kept Max Verstappen at bay, with the Dutch teenager disappointed his car didn’t have the pace to pull off more passing moves after he too started out of place at the back of the grid. Felipe Nasr finished on his own and two laps down, while Will Stevens ended up four laps down after his clash with Grosjean and the sole finisher for Manor after teammate Roberto Merhi retired. McLaren’s Fernando Alonso and Jenson Button were the only other retirements of the race, both with power unit troubles despite Honda bringing an upgraded ending to the Canadian Grand Prix.